Sunny at 11 today with a northeast wind. felt cold. Photos are North York river south of trail at higher tide and of Aspen (the Bike) waiting for me on the trail. I cycled to the Charlottetown mall, then on trail to Loyalist road, back to Milton and then took the Warren Grove road home. logged 30 km and did 10 km on EB this morning. I started in Milton and cycled to Hunter River and then back to Milton. The depth of snow was 50 cm for about 100 meters. I started at 6:00 PM and temp was 8 and when I got back at 8:20 PM it was 3. Photos are maple tree budding out, farmer cultivating field that was growing potatoes last year and snow on trail in North Wiltshire area. It was sunny but some wind out of the west. I logged 35 km on Aspen and 10 on EB. This afternoon it was 23, sunny and strong winds. This evening it is raining and temp is 14. I started at 3:00 and cycled the same trip as I did on Sunday and logged another 35 km on Aspen. Photos are flowers that are by the basement wall. 10 km on EB this morning. In Montague all day at FPEIM meeting. Sunny at 12 with winds 30 km/h or more. Photos of trail taken in Hampshire. I cycled to Charlottetown Mall, then on the trail to the Colville road and returned to Milton. Then cycled home on Rte 248. Logged a total of 35 km on Aspen. 10 km on EB this morning. Sunny with a high temp of 22, light wind as well. I cycled to Charlottetown Mall, took the trail to 1 km west of the Loyalist Road where there was snow on the trail. I cycled back to Milton and took the road home. I logged 17 km on trail and total of 30 km for the ride. Photo of river is the North York river north of the trail and there is one of snow on trail. Played cards at Hampshire this evening. I started cycling at 6:30 PM, cycled to Charlottetown Mall, then started on trail and cycled to the Loyalist Road and back to the Milton road. Still snow on the trail in a couple of places. The photo of trees and water is the upper end of the North York river as seen from the trail at low tide. I logged at total of 28 km, 15 km on the trail. I was back home at 8:00 PM. 10 km on EB this AM. If you wish to see the photos full screen, just click on the photo. Trail photo is in Winsloe area, trail soon will be dry enough for cycling. Photo in woods, same location as previous woods photo, no snow now but still lots of water running. Photo of clouds with the setting sun shining on them. Temp around 10 but windy this evening, I cycled around town and logged 13 km. 10 km on EB this morning. Rain at 12 here today. Two photos of a large truck, any guesses to how many tires are on it? 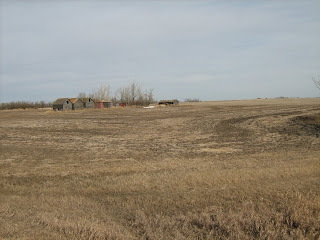 The photo of cleared land, I thought it was start of a road but was told a pipeline had been put in and top soil not leveled yet. 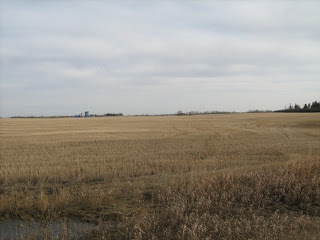 Photos of oil rigs were about 20-25 km southeast of Killam and there seemed like the was 200 of them within 4-5 km. Usually the rigs are not close together. No cycling today, not even on EB. On Sunday In cycled to Sedgewick, 11 km one way and on Monday I cycled to Strome, 15 km each way. All told I was cycling for about 12 hours, I would estimate 175 km in the six days. This post is for April 16, too busy visiting to do it last evening. Temp started out at -4 but warmed up to 10 or better. 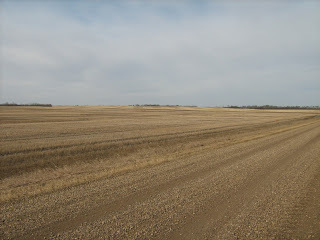 I cycled out of town 5 or 6 miles and took some photos. I was cycling for two hours and approximately 30 km. Posting a couple photos, One of the plane and the other taken here this morning. Temp got up to 12 this afternoon with sun and very light wind. I was cycling for two hours and I would estimate 30 km. 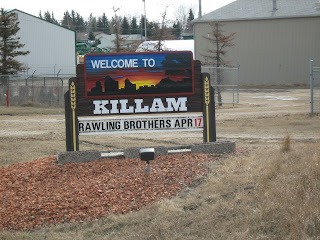 Hi all, now in Killam, Sunny at 9 with no wind. There is a bicycle in the shed, so I am going for a ride around the town. The first photo taken around 8:00 AM and the second one at 2:30 PM. Sun had being out for awhile but cloudy when photo taken. Temp was +4 and we had maybe 2-3 cm of snow. In less than 4 hours I will be on the plane to Alberta. No cycling today but 15 km on EB. Snow flurries all day at +2 and windy, 45 gusting to 60. But no extra snow on the ground. I was in Montague this afternoon and the sun was out and no snow. Photo taken in woods where I was skiing a six weeks ago, A fair amount of water running in that area now. I had a 30 minute walk this evening though the woods and took the photo. I may miss a few days over the next week as I will be in Alberta. 2-3 cm of snow here this morning, all gone now. I understand the west end had 20-25 cm of snow and some places were without power. High temp for the day was +3 and is at zero now. I have being told the flowers in the photo are not Crocuses. Anyone know what they are? + 9 and overcast today when I was cycling, I cycled around town and logged 20 km. Kevin Martin played a good game today in the curling, I hope he is on his game tomorrow. Sunny at +9 with light westerly wind today. I cycled to Charlottetown and on the trail from Joe Ghiz park out to the Sherwood road. Trail dry until I got to the Sherwood road, Then snow on trail, see photos. I logged 30 km on the trip. 10 km on EB this morning. This afternoon sunny at +9 with SW winds 33-35 km/h, the wind dropped down in evening to10-15 km/h. Photo taken in evening as the sun was going down, of ice cakes in harbour looking towards Victoria park. Sun with cloudy periods at +8 today with SW wind at 35-40 km. The ice is moving out of the North River, the wind pushed it into the Charlottetown shore. 10 km on Aspen on the streets around town and 10 km on EB this morning. Today rain at +8 and wind gusting to 60kmh. 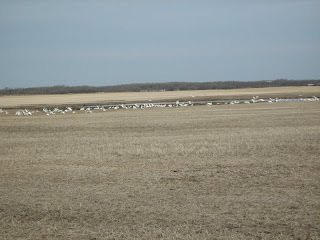 Photo of ball field showing seagulls, they often come inland when it is windy, also notice the vapor rising from the snow. They was a lot of snow melting today. I expected to see a good curling game this evening between Norway & Canada but it was not to be, Canada won in six ends. The snow is slowly leaving the ball field. Forecast is for 10-15 mm rain so that should take more snow. Overcast at +7 today. 10 km on EB this morning. Busy watching the world curling that is being held in Moncton. Overcast with some showers at + 4 today, A lot of the snow has gone, looks like the cross country skiing is over for the season. Photos are of Daffodils just about to bloom and some Crocuses. Or at least I think they are Crocuses. After three days driving, two which it rained all day and some fog today, I am home. Arrived home to sun and 14 but this evening it is raining again. Photo is of dairy cows in pasture, they may not all be in photo but there is 300 of them. No cycling for the last three days.